There is no job more fulfilling, or certainly more demanding, than that of raising children. For every endearing moment there are twelve others that have even the most dedicated parent wondering why they’ve chosen to breed. While flowers won’t help with the early mornings, endless tasks and constant demands of childrearing, a vase full of fragrant hyacinths can be a spot of peace and beauty where little ones run amok. These spring-blooming bulbs are small but mighty and a little vase in just the right place can have all the rejuvenating effects of a mid-day nap. The flowering bulbs of the hyacinth plant are native to the Mediterranean and Middle East, where there were cultivated ornamentally and integrated culturally into festivals and holidays like the New Year, Nowruz, which celebrates the spring Equinox. Through trading routes, the hyacinth bulb was brought to the Netherlands, where it continues to be propagated commercially today and shipped as bulbs all around the world. Large, strap-shaped leaves are the first thing to peak out of the bulb and lovingly wrap the stocky stem as it emerges with bell-like, pendulous flowers. Available in purple, pink, blue and white, the small flowers are long and open up into a star shape, completely covering the stem and emitting a strong, sweet scent. Both calming and flowery, the fragrance of a hyacinth is uniquely floral and hard to breath in without wanting to close your eyes ad breath deeply. In the Victorian language of flowers, they hyacinth was said to send a message of kindliness and playfulness- a good sentiment for someone in a stand-off with a three-year-old to have. Hyacinth bulbs are traditionally planted outside in the fall and are one of the first flowers to peak through the snow each spring. They can be “forced” by placing in soil in a container in winter and brought in from a cold place to warm in February. The are available this time of year, therefore, as both a potted plant as well as a cut flower at your local florist. Choose stems that are long with flower that are just beginning to peak out towards the bottom, as bloom open upward towards the top. 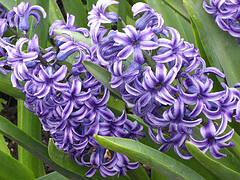 In a house full of children, it’s important to note that the actual bulbs of the hyacinth are toxic, so choose cut stems of these beauties and arrange them in a round vase with a few hypericum berries or cheery gerber daisies for an arrangement that is safe for both looking, smelling, and (just in case) eating as well!